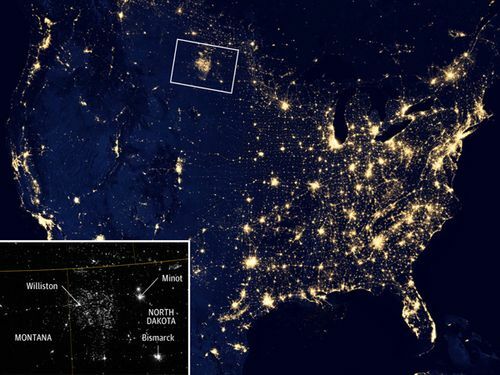 NASA Earth Observatory’s Suomi Satellite captured the night time glow from hundreds of flares from rigs drilled into the Bakken shale oil formation of North Dakota, a 360-million-year-old tectonic plate, creating a light show the size of metropolitan Boston. In forty years of active engagement in debating Britain’s energy policy I have never come across a contribution as mendacious as that from Tony Hayward (1) published in the Times on July 30th. He begins by informing us that we ‘must be less emotional and more strategic’. What follows is an intensely emotional and distorted rant against government action on climate change and support for renewables. Governments, he asserts, have ‘enforced random decarbonisation targets set after junkets in exotic foreign cities’. When I read this I revised my opinion of his prowess as a communicator. During BP nightmare in the Gulf of Mexico I thought he was given a very rough ride by the American media. It seemed to me that a rather typical bit of British understatement had been deliberately distorted by their media mavens. He had my sympathy. I was wrong. The US media clearly got him right. This is someone who makes a tin ear look acutely sensitive. I suspect that Mr Hayward’s view of the global effort to tackle climate change owes more to his experience at global oil industry meetings than any acquaintanceship with the climate negotiations. And I suppose if you have had BP’s experience at delivering shareholder value and building a deeply ingrained safety culture the word ‘random’ would come easily to mind. The rest of the piece proceeds in like manner vomiting up further gobbets of sour distemper. It would not be worth the trouble of drawing it to your attention were it not for the fact that this looks increasingly like a part of the oil industry’s strategic global game plan for preserving its present place in the energy mix. The oil industry, or at least that part of it that matters to Britain, is now really a gas industry. Increasingly shut off from access to new oil reserves by the nationally owned companies it now generates more and more of its revenues from gas. Its big growth market is to replace coal in the production of electricity. What has become clear from Germany’s massive drive for renewables, however, is that they compete directly, and successfully, with gas. The more renewables in your electricity generation, the less need you have to burn gas. Hence the virulence of Mr Hayward’s ill-tempered and ill-informed attack on renewables. Government support for renewables is a direct thereat to the future of the oil companies. They are getting their retaliation in first. Make no mistake about it, for all its incoherent and unpersuasive bile, this Times piece reflects a serious effort by serious people to slow down efforts to stop climate change. We will be hearing a lot more of this argument in the future and it will certainly be better communicated. (1) Mr Hayward was the CEO of BP at the time of the Deepwater Horizon oil spill. He is now the CEO of Genel Energy whose corporate vision is ‘to create value with the drill bit’. Clearly, if we cannot safely burn the fossil fuels we have already discovered there is not much point in having an exploration company like Genel.